W100 listed top female entrepreneur, Karina Hayat, announces empowering female entrepreneurial initiative “SHe Accelerates” in Vancouver BC. - Prizm Media Inc.
W100 listed top female entrepreneur, Karina Hayat, announces empowering female entrepreneurial initiative “SHe Accelerates” in Vancouver BC. 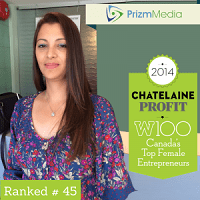 Karina Hayat, President/Co-founder of Prizm Media Inc., who was recently listed as one of Canada’s Top Female Entrepreneurs in the 16th annual W100 ranking produced by PROFIT, Canadian Business and Chatelaine announces female-focused entrepreneurial initiative “SHe Accelerates”. A hub that aims to encourage, guide and support up and coming entrepreneurs with tools, workspace and resources that can help them accelerate their businesses. Karina was ranked #45 out of 100 of the country’s most successful female business owners based on the size, growth rate and profitability of their businesses. Her contribution to the company’s strategy has helped Prizm Media become the lead generation company of choice for some of the fastest growing durable medical equipment providers and mail order pharmacies in US and Canada. A 2014 article in the Journal of Global Business and Organizational Excellence claims that nearly seven million women in North America have become entrepreneurs. In fact, women – 80% of whom are mothers – launch four out of five small to medium sized businesses. These statistics reflect just how many women are actively challenging the harmful stereotypes placed on working mothers by embracing their own values, making their own rules, and ultimately writing their own success stories as Karina has done. “SHe Accelerates” has secured a location and with furniture already on its way, the initiative is on track to launch before the new year. Prizm Media is the lead generation company of choice for some of the fastest growing durable medical equipment providers and mail order pharmacies in US and Canada. With over 12 million leads generated, the company has directly impacted revenue growth for over 600 clients. Recently listed #52nd Fastest growing Company in 2014′s PROFIT500, w100 and Forty Under 40 listed cofounders, and recognized by the Better Business Bureau of Mainland BC as a finalist; Prizm has become a thought leader in the healthcare lead generation field. Visit https://www.prizmmedia.com. Your Guide to Business Success is Canada’s preeminent media brand dedicated to the management issues and opportunities facing small and mid-sized businesses. For 32 years, Canadian entrepreneurs across a vast array of economic sectors have remained loyal to PROFIT because it’s a timely and reliable source of actionable information that helps them achieve business success and get the recognition they deserve for generating positive economic and social change. PROFIT appears inside every issue of Canadian Business and is online at PROFITguide.com. Founded in 1928, Canadian Business is the longest-serving, best-selling and most-trusted business publication in the country. With a readership of more than 750,000, it is the country’s premier media brand for executives and senior business leaders. It fuels the success of Canada’s business elite with a focus on the things that matter most: leadership, innovation, business strategy and management tactics. Canadian Business provides concrete examples of business achievement, thought-provoking analysis and compelling storytelling, all in an elegant package with bold graphics and great photography. Canadian Business—what leadership looks like. The country’s leading women’s media brand, Chatelaine makes “Everyday Extraordinary” for Canadian women and has been doing so for more than 85 years. Today, Chatelaine is a six-platform brand: available on television, radio, tablet and smartphone, plus in print and online. Chatelaine has a lively presence on social media sites, and Chatelaine.com is Canada’s most engaged digital community for women 18+. With a team of “extraordinary” experts, Chatelaine brings together the very best of food (from The Chatelaine Kitchen powered by GE Café), style, decor, health and real life for women who want to look good, do good, feel great and make every day a little bit special. Chatelaine also has a line of retail products. Chatelaine is owned and operated by Rogers Media Inc., a division of Rogers Communications.